We do everything we can to meet our clients' needs. However, it can be difficult to effectively deliver on a client's needs when their needs are constantly changing. One of our clients needed an on-site person every day as well as someone to work in the office. Because of these shifting needs, he wasn't always able to recruit the required staff on his own. When a company is understaffed, the business suffers. The client needed the help of a staffing agency so he could focus his time and energy on more important tasks. The client's needs changed daily. When it comes to recruiting and staffing, depending on the company, a client's needs can quickly and frequently change. We had to keep up with the client's constantly changing needs in order to deliver effective staffing solutions so they could continue to operate optimally. 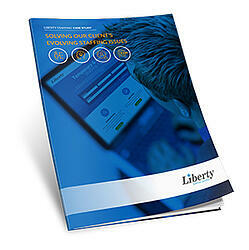 Fill out the form on the right to download your copy of "Solving Our Client's Evolving Staffing Issues" case study, and find out how Liberty Staffing Services built a strong relationship with the client and solved their staffing needs. © 2019 Liberty Staffing Services Inc.